Pier Luigi Bersani, head of Italy's Democratic Party, will face his main rival Matteo Renzi in a runoff next week to pick the centre-left's candidate to succeed Mario Monti as prime minister, following the first round of a primary vote held yesterday (25 November). With almost half the results counted, Bersani led with about 44%, ahead of Renzi, the youthful and modernising mayor of Florence, who was on around 36%, according to party officials, better than had been expected. Both candidates have pledged to maintain the budget discipline pursued by Monti's technocrat government and to respect Italy's commitments to its European partners. Both also say they will encourage growth and not blindly pursue austerity policies. 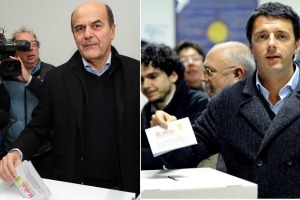 "Pier Luigi Bersani has won the first round," Renzi told supporters late on Sunday. He promised a "loyal" contest before the runoff vote on 2 December. "If we don't succeed, we'll lend a hand and together we will try to win and finally close the ugly chapter left by the centre-right," he said. Nichi Vendola, the openly gay head of the left-wing Left, Ecology, Freedom party was in third place with 15%, while the remaining two candidates, Bruno Tabacci and Laura Puppato, trailed far behind. The outcome of the second round will remove one major element of uncertainty dogging Italian politics ahead of spring elections to choose a successor to Monti's government, which took over after Silvio Berlusconi stepped down as prime minister in November, 2011. Monti has said he will not run in the next election, expected in March, because it would destabilize the right-left coalition that now supports him, though he has left open the possibility of staying on if there is no outright winner. The centre-left alliance is well ahead in opinion polls for the election, although uncertainty over what electoral system will be used in the ballot means it is unclear whether it will be able to form a government without seeking allies from centrist parties. Even so, the winner of the primary will be in pole position to take over Monti's mantle, and his efforts to control strained public finances as a means of tackling a deep recession. While the slick and dynamic Renzi, 37, is much more popular across the general population, the 61 year-old Bersani's core support among traditional PD party voters proved decisive. "It's been a magnificent day. I'm extremely happy," Bersani said as his lead in the vote became clear. The unified front contrasts with deep divisions in the centre-right over whether to stick with Monti's unpopular economic policies. Support for Berlusconi's People of Freedom party (PDL) has crumbled to less than half of what it recorded in the last election in 2008. Berlusconi, who has changed his mind several times over whether or not to run in the election, added to the chaos facing the PDL when he said on Saturday he was again thinking about standing, throwing plans to hold a centre-right primary into doubt. About 4 million party and non-party voters took part in the centre-left vote, with queues forming at several outdoor polling booths in cities across Italy. Democratic Party (PD) officials said the strong turnout at the poll, which was not restricted to party members, ensured the next centre-left leader would be chosen in a fair and democratic way. "With this level of participation and with very clear rules, there is full and complete legitimacy," said PD deputy leader Enrico Letta, a Bersani supporter. "The candidate for premier who emerges from this election will be extremely strong." While the PD has supported Monti's government in parliament, neither Bersani nor Renzi think the former European Commissioner should return as prime minister after the vote. Business leaders have expressed strong support for a second term for Monti, who has implemented a tough programme of spending cuts, tax hikes and labour reform to cut the massive public debt and restore economic competitiveness. Monti, who has said repeatedly he would be ready to serve a second term if needed, kept up a diplomatic silence about his future on Sunday, saying only that he would consider what contribution he could best make. Protests on Saturday by tens of thousands of students and workers from across the political spectrum highlighted the levels of discontent among Italians grappling with the slump and rising unemployment in the euro zone's third biggest economy. Further complicating the national political picture is the dramatic rise of the anti-establishment 5-Star Movement, which is now second in opinion polls. Around half of Italians say they are either undecided or will abstain. Italy's mix of chronically low growth, a public debt mountain of €1.84 trillion, or 120% of GDP, and a struggling governing coalition are causing growing alarm on financial markets. The country, which has been politically unstable for years, would need at least €600 billion in the case of a bailout, more than the balance of the eurozone's current bailout fund. Prime Minister Mario Monti, when he took office one year ago, signed up to predecessor Silvio Berlusconi's goal of balancing Italy's budget by next year. Challenges to that target have grown, however, as the 30-billion euro austerity plan that Monti rushed through at the end of last year, made up largely of tax increases, is partly to blame for this year's recession, which has in turn worsened the outlook for public finances.